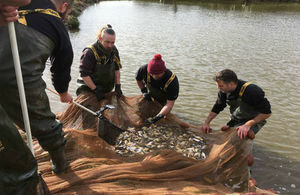 The fish and larvae produced by the National Coarse Fish Farm play an important role in the work of the Environment Agency and its partners to restore, improve and develop sustainable fisheries in England. All of the fish farm’s work is funded by income from fishing licence fees so it’s great to see it setting new records for the number and weight of healthy fish it has produced for recovery and re-stocking. 2018 has been an exceptional year in terms of the number of fish produced. The size and weight of the fish has also been outstanding and we have succeeded in smashing all of our production records. We have achieved these record breaking figures despite the difficult conditions that resulted from the hot, dry summer of 2018. While the fish grew quickly in the warmer temperatures, the team had to work hard to maintain optimal oxygen and pH conditions in the ponds. It is a testament to their dedication and professionalism that all their hard work paid off at harvest time. We take great care in ensuring that every fish is fit for purpose when stocked out into the wild. During their 18 months at the farm, the fish are fed live natural food, they encounter a range of flora and fauna, and are trained in flowing conditions while being grown in the earth ponds.